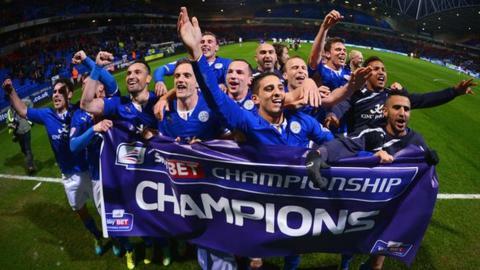 Leicester clinched the Championship title with two games to go following a narrow victory at Bolton. Andy King and Riyad Mahrez went close early on for the long-time leaders as Nigel Pearson's men dominated. Bolton almost took the lead after the break but striker Lukas Jutkiewicz was denied by keeper Kasper Schmeichel. Lloyd Dyer's second-half goal proved decisive, the Foxes midfielder cutting in to find the net from distance with 25 minutes left. And Leicester, who registered 20 shots on goal to Bolton's 12, deservedly recorded a 13th away win of the season in front of their 2,000 travelling fans. Leicester remain on course to break the 100-point barrier - they can reach 102 by winning their final two games. Manager Nigel Pearson has guided the club back into the top-flight for the first time in a decade. Their tally of 13 away wins is the best in the Championship this season. They should have won with something to spare, as the influential Danny Drinkwater and Ritchie De Laet both tested keeper Adam Bogdan. And they had strong penalty appeals turned down when Tim Ream blocked a shot from Anthony Knockaert as the visitors pressed for the opening goal. Bolton came more into the contest in the second half, striker Jutkiewicz seeing his effort saved by Schmeichel as the hosts enjoyed their best spell. But it only succeeded in galvanising the visitors - Dyer using his pace to find the net with a powerful shot after cutting in from the left. Bolton pressed for an equaliser but could not find a way through as Leicester moved seven points clear of second-placed Burnley. It is now just one defeat in 20 games for Premier League-bound City, who travel to Huddersfield on Saturday boasting the Championship's best away record. "It was nice to win it ourselves, especially having gained promotion when we didn't play. "I'm building a team that is committed and is going to put their bodies on the line for the cause. You can start to see that in the second half of the season with our points tally. "Leicester have done it in a way that I would like to copy with young, hungry players. Match ends, Bolton Wanderers 0, Leicester City 1. Second Half ends, Bolton Wanderers 0, Leicester City 1. Attempt missed. Zat Knight (Bolton Wanderers) right footed shot from outside the box is close, but misses to the right. Assisted by Jay Spearing. Attempt missed. Lukas Jutkiewicz (Bolton Wanderers) header from the centre of the box misses to the left. Assisted by Matthew Mills with a cross. Substitution, Leicester City. Dean Hammond replaces Anthony Knockaert. Delay in match Lukas Jutkiewicz (Bolton Wanderers) because of an injury. Attempt saved. Chris Wood (Leicester City) right footed shot from the right side of the box is saved in the bottom right corner. Assisted by Matthew James. Substitution, Bolton Wanderers. Chris Lester replaces Lee Chung-Yong. Attempt saved. Anthony Knockaert (Leicester City) left footed shot from outside the box is saved in the centre of the goal. Assisted by Lloyd Dyer. Attempt saved. David Wheater (Bolton Wanderers) header from the centre of the box is saved in the top centre of the goal. Assisted by Zat Knight with a headed pass. Corner, Bolton Wanderers. Conceded by Ritchie de Laet. Attempt saved. Jermaine Beckford (Bolton Wanderers) left footed shot from the centre of the box is saved in the bottom left corner. Assisted by Lukas Jutkiewicz. Corner, Leicester City. Conceded by Zat Knight. Substitution, Bolton Wanderers. Andy Kellett replaces Robert Hall. Corner, Bolton Wanderers. Conceded by Kasper Schmeichel. Attempt saved. Lukas Jutkiewicz (Bolton Wanderers) right footed shot from the centre of the box is saved in the bottom left corner. Attempt blocked. Anthony Knockaert (Leicester City) left footed shot from a difficult angle on the right is blocked. Assisted by Daniel Drinkwater. Attempt missed. Matthew James (Leicester City) right footed shot from outside the box is high and wide to the right. Assisted by Lloyd Dyer. Attempt blocked. Daniel Drinkwater (Leicester City) left footed shot from the left side of the box is blocked. Assisted by David Nugent. Attempt missed. Jermaine Beckford (Bolton Wanderers) left footed shot from outside the box is high and wide to the left. Assisted by Lukas Jutkiewicz with a headed pass. Attempt missed. Zat Knight (Bolton Wanderers) header from the centre of the box misses to the left. Assisted by Lee Chung-Yong with a cross following a corner. Corner, Bolton Wanderers. Conceded by Paul Konchesky. Goal! Bolton Wanderers 0, Leicester City 1. Lloyd Dyer (Leicester City) right footed shot from the left side of the box to the top right corner. Assisted by Chris Wood. Attempt missed. Lukas Jutkiewicz (Bolton Wanderers) right footed shot from the right side of the box is close, but misses to the left. Assisted by Jermaine Beckford. Attempt missed. Lukas Jutkiewicz (Bolton Wanderers) left footed shot from the centre of the box misses to the right. Assisted by Lee Chung-Yong. Corner, Leicester City. Conceded by Liam Trotter. Substitution, Leicester City. Lloyd Dyer replaces Riyad Mahrez. Substitution, Leicester City. Chris Wood replaces Andy King.